As a veterinarian I am often asked what people should feed their horses. Many people tell me that they simply feed their horses oats and grass hay, and their horses experience no problems. While this seems to work for some horses, it doesn’t often work well for most horses. To me, feeding and caring for a horse is much like maintaining a truck. Sadly, I often see people take better care of their trucks than their horses. Feeding a horse only hay and oats is like saying that you put gas in your truck and it runs smoothly. Your truck may run well for a short time, but eventually it will need maintenance. Horses are no different. Like a truck, a horse’s body will suffer from wear and tear over time, and need supplements and feed above and beyond hay and oats to stay healthy. While certain horses are blessed with naturally good health or live in parts of the country where the native grasses and feed are nutritious, allowing good health on a bare bones diet, most horses are not as lucky. In many parts of the country, local hay and feed are not nutritious enough to support the health of a hardworking horse. In these cases, we need to provide extra support if we want our horses to stay healthy and sound throughout their lives. Where do you start to feed your horse for optimum health? The foundation of a horse’s health is his digestive tract. Just as you change the oil in your truck regularly to keep it running smoothly, you need to make sure that your horse’s digestive system is clean and functions properly. For your horse’s digestion to function well, it needs a good balance of healthy beneficial bacteria. Factors that negatively impact this balance include stress, vaccinations, drugs, and poor feeding choices, such as high-starch diets. The horse’s digestive tract is designed to process roughage in small frequent amounts, with continual motion to stimulate motility. Most horses don’t have this kind of lifestyle, and are instead confined and fed twice a day. Because this is not the ideal environment for proper horse digestion, we can support the digestive tract by feeding prebiotics and probiotics on a daily basis. Examples of prebiotics include KAM KLPP and PrePro. Probiotics include acidophilus and bifidus. Some horses also need digestive enzymes to ensure that feed is properly digested before it reaches the large intestine. Simplexity Health’sEssentials provide a convenient source of probiotics, enzymes, and chlorophyll-rich food. Once you know that your horse’s digestion is working well, you know that your horse can assimilate all the necessary nutrients in his feed. Your horse’s digestive tract is designed to select the needed nutrition from his diet, assuming that he has a whole food source of nutrition. For instance, horses allowed to forage in native grass pastures will select from various weeds, herbs, and grasses to meet their needs. Some weeds, like dandelions, are actually high in the whole food vitamins and minerals that your horse needs to be healthy and keep his system clean. The weeds that come up in the spring also clear the horse’s liver and kidneys, which tend to be stressed during the winter when fewer green foods are available. If your horse is confined he doesn’t have access to these natural herbs and chlorophyll-rich foods, so feeding supplements such as blue green algae can fill the nutritional gap. Herbal and whole food supplements such as Four Hooves and Simplexity Health Essentials contain a solid blend of vitamins, minerals, and chlorophyll. With our trucks we don’t wait for the brakes to fail before we schedule a maintenance service. Yet we sometimes expect our horses’ joints to keep functioning indefinitely, and only attend to them when they go lame. 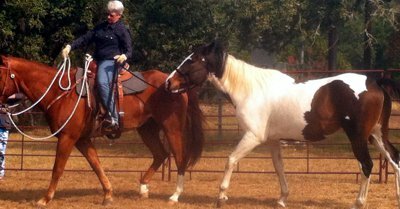 It is so much easier to maintain your horse’s joints than to “fix” them when he goes lame. Luckily it is easy to keep them functioning well into his late teens with a few simple maintenance steps. Once you have taken steps to ensure that your horse has good digestion so he can assimilate all the vitamins and minerals to build strong bones and healthy cartilage, you next need to check whether he needs extra supplements. Horses that put extra pressure on their joints may wear down their joints faster than their bodies can create healthy cartilage cells. Supplements such as Cosequin, Adequan, and Legend can be added to your horse’s program as he gets older and/or his work load increases. You can maximize the effects of these supplements by feeding them with a strong nutritional program, like the one we discussed above. In addition to strong bones and joints, your horse needs supple muscles, tendons, and ligaments. Maintaining these areas of your horse’s body is akin to giving your truck a lube job. In addition to a strong nutritional foundation, hard working horses may need additional support. Supplements that specifically target the muscles, tendons, and ligaments include Ani-Motion and MSM. In some cases, additional magnesium may be needed. Produces such as Cosequin and Adequan will also support both healthy joints and supple connective tissues. If you stress your horse’s connective tissues during a competitive event or during hard training, you can provide additional support with antioxidants. Hard exercise produces free radicals in the body which, if not neutralized, can produce stiffness. Antioxidants may be all your horse needs during extra hard word to prevent damaged muscles. Natural antioxidant sources include wheat sprouts and coeznyme Q10 (Simplexity), mangosteen juice, and noni juice. In short, whether you are caring for your horse or your truck, your goal is prevention rather than “fixing problems” after they occur. Withs both horses and trucks, a soild maintenance program prevents all the expense and hassle of dealing with a “breakdown” by the side of the road!